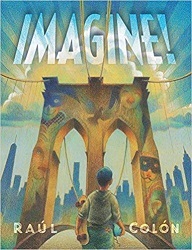 ﻿ Sonderbooks Book Review of Imagine! A Paula Wiseman Book (Simon & Schuster Books for Young Readers), 2018. 44 pages. Look! A 2018 picture book that I can review! Why can I review it? Well, I’m on the 2019 Newbery committee, but the Newbery Medal is given for the text of a book – and this book has no words. So it can’t win. (The Caldecott Medal is another story, by the way.) And I can review it. In this book, a boy leaves his house on a skateboard and crosses a bridge to go into the city. He enters the Museum of Modern Art and checks his skateboard at the checkroom. But when he looks at the paintings, some of the characters come out and join him! The first one, from Matisse’s Icarus, dances with him, and they climb into Picasso’s Three Musicians and get the musicians to come along, too. Next they round up a lion and another musician from Rousseau’s Sleeping Gypsy. Now they practically have a band! The happy throng goes out of the museum, exchanging instruments along the way. They have joyful adventures around New York City. They finish up in Central Park with songs, balloons, and bubbles. When the adventures are done, it’s back to their paintings, and then the boy rides his skateboard back home. And he finishes by drawing a mural of his day with his friends. This is a beautiful and joyous book. I feel confident that children will find more in its pages every time they go through it.